Artist Felix Gonzales Torres shone bright this week as an untitled work led the way across the block at Christie’s, sparking a final bid of $857,000. 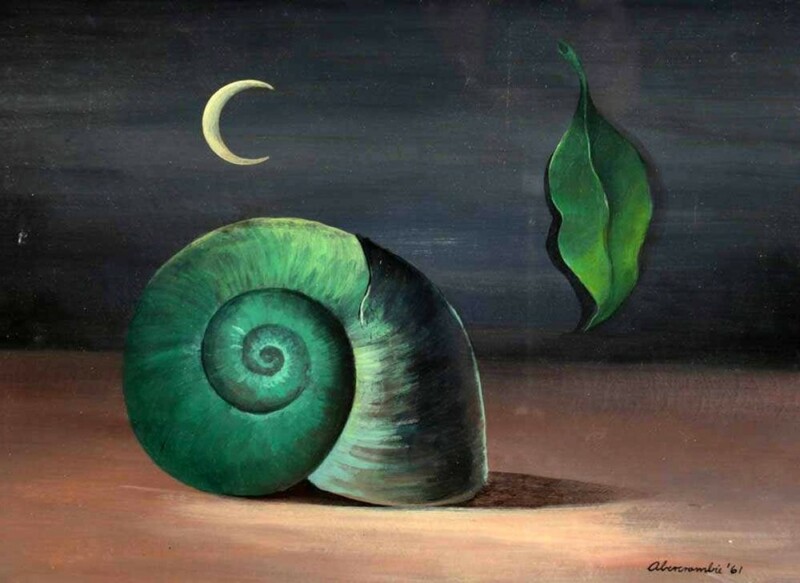 At Kaminski Auctions, a painting of a snail by surrealist Gertrude Abercrombie brought a final bid of $28,800. Bidding on sports memorabilia was brisk at Goldin Auctions’ Winter sale as the firm set an auction record for any item ever offered from Mike Trout. The center fielder continues setting the transactional bar high as he and the Los Angeles Angels finalize the largest contract in professional sports history, a 12-year deal worth more than $430 million that will smash previous records. These and more in this week’s Across The Block. NEW YORK CITY – Christie’s postwar to present auction on February 28 totaled $20,963,750, selling 75 percent by lot and 88 percent by value. The top lot of the sale was Felix Gonzalez-Torres’ untitled (Last Light), shown, which realized $857,000. Exceptional prices were also achieved by Beauford Delaney’s “Abstraction No. 4,” which sold for $387,000, and Nicolas Party’s “Portrait,” which achieved $275,000 against a high estimate of $120,000. For information, 212-636-2000 or www.christies.com. 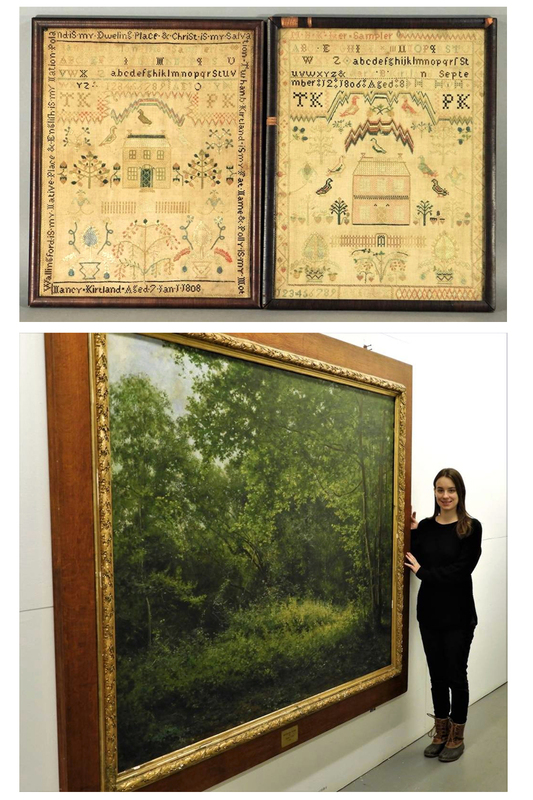 Large Landscape Painting & Folk Art Samplers Tie For Top Honors At Bruneau & Co.
CRANSTON, R.I. – A matching pair of 1806 Ohio folk art sister textile samplers and a large landscape painting each earned $10,000 at Bruneau & Co’s March 2 auction. The samplers were executed by Kirtland family sisters, one identified “Nancy Kirtland Jan 1808 age 7,” the other “Sara B Kirtland September 1806 age 8.” Each was decorated with a central home motif surrounded by birds with strawberry bushes and trees, identified as Wallingford, Ohio. The Impressionist painting depicted a thicket of trees, shrubbery, wild grass and flowers beneath a blue sky with billowing clouds. The painting was originally commissioned for the interior of the Maisons-Laffitte in France, most likely removed during a remodel during the early Twentieth Century. For information, www.bruneauandco.com or 401-533-9980. MONSON, MASS. – The Quaboag Country Club was the site of Wintergarden’s antiques auction on March 2, featuring a diverse lineup of everything from vintage Ovation guitars to jewelry, lighting, Midcentury Modern chairs and a full shoulder bison mount. 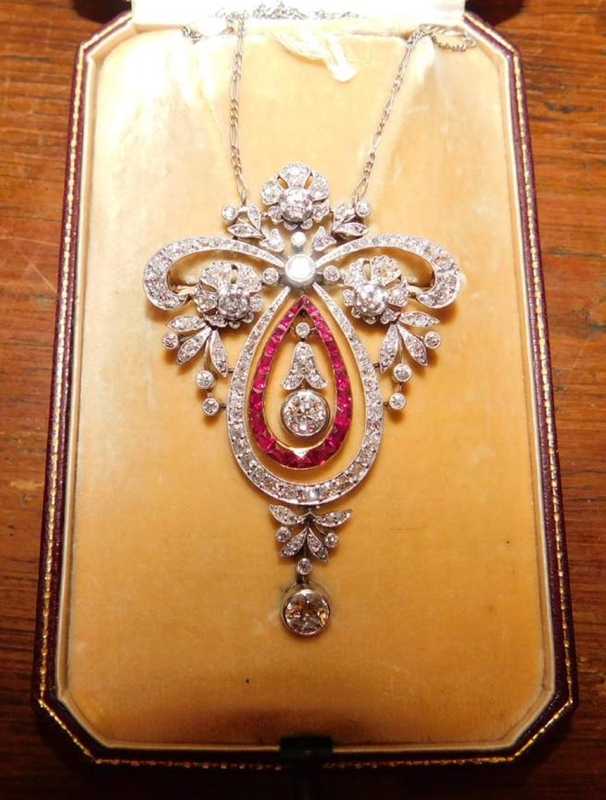 A highlight of the sale was a 14K Edwardian lavaliere with 141 diamonds that sold for $4,600. A lavalier is an item of jewelry consisting of a pendant, sometimes with one stone, suspended from a necklace. Edwardian jewelry is the last jewelry period to be defined by a British monarch – from about the 1890s to the beginning of World War I – a time when society was at the height of elegance and sophistication, as evidenced by this piece. For information, 413-267-3786 or www.wintergarden.com. BEVERLY, MASS. – Kaminski Auctions’ March 2-3 sale featured a selection of American, European, Russian and Modern art. The 1,000-lot, two-day sale showcased paintings from a lifelong collector in Salem, Mass. American art in the sale was highlighted by a Surrealist oil-on-board painting of a snail by Gertrude Abercrombie, which sold on the second day of the auction for $28,800. An American painter based in Chicago, Abercrombie (1909-1977) was called “the queen of the bohemian artists” and was known to hang out with jazz musicians whose music inspired her work. For information, 978-927-2223 or www.kaminskiauctions.com. RUNNEMEDE, N.J. – The Kareem Abdul-Jabbar collection stole the headlines while historic sale prices of items from Mike Trout, Ty Cobb, Willie Mays, Mickey Mantle and Kevin Durant also turned heads on March 2 as more than 2,000 lots of memorabilia in the Goldin Auctions 2019 winter auction sold for nearly $6 million. Half of the auction sales ($2.9 million) were attributed to the 247-lot Kareem Abdul-Jabbar collection, which included four NBA championship rings selling for a combined $1.2 million, three NBA MVP Awards netting a combined $366,000 and eight NBA All-Star jerseys selling for $400,000. 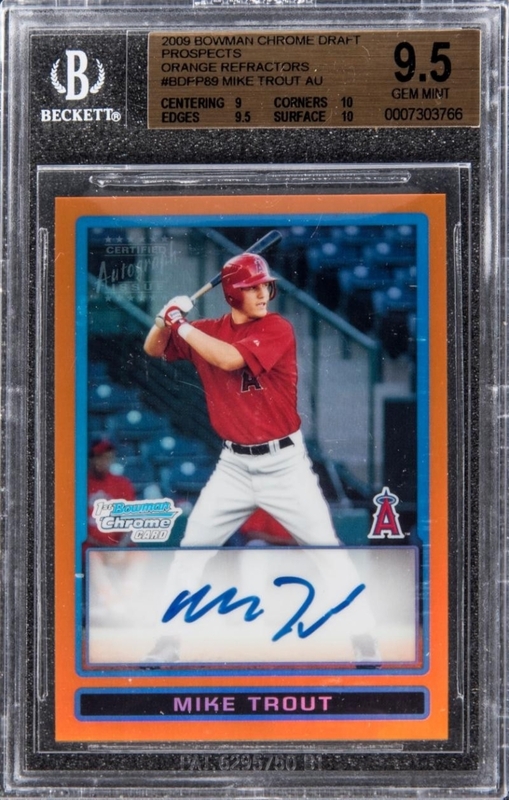 The most remarkable result of the night for collectors was the $186,580 sale price for the 2009 Bowman Chrome Draft Prospects #BDPP89 Mike Trout (Orange Refractor), making it the most valuable Trout item ever sold at auction. It joins two other historic record-setting modern cards sold by Goldin Auctions in the past few years, including a 1979-80 Wayne Gretzky rookie card selling for $465,000 and the 2003-04 LeBron James Upper Deck Ultimate Collection Logoman Rookie Card at $312,000. For information, 856-767-8550 or www.goldinauctions.com. RED WING, MINN. – It was high style on parade at the annual Jay Anderson Fantastic Antique Auction, conducted in the Red Wing Armory on March 2. There were Horner and Meeks furniture pieces, Viennese clocks, heavily carved bedsteads and many examples of early lighting, focused on the period when gas was the way Americans lit their homes. 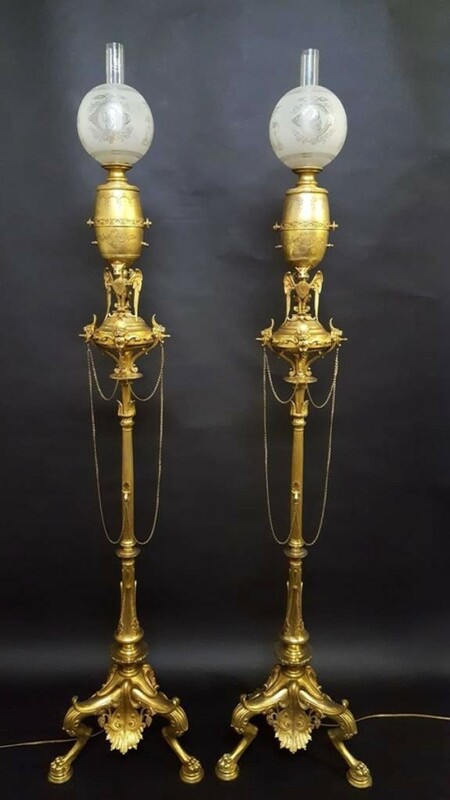 In this category, a pair of gilt-bronze gas floor lamps, circa 1870s, probably French and exhibiting the quality of Barbedienne with period etched shades, finished at $9,075. For information, 651-565-4801 or www.jayandersonauction.com. LONE JACK, MO. 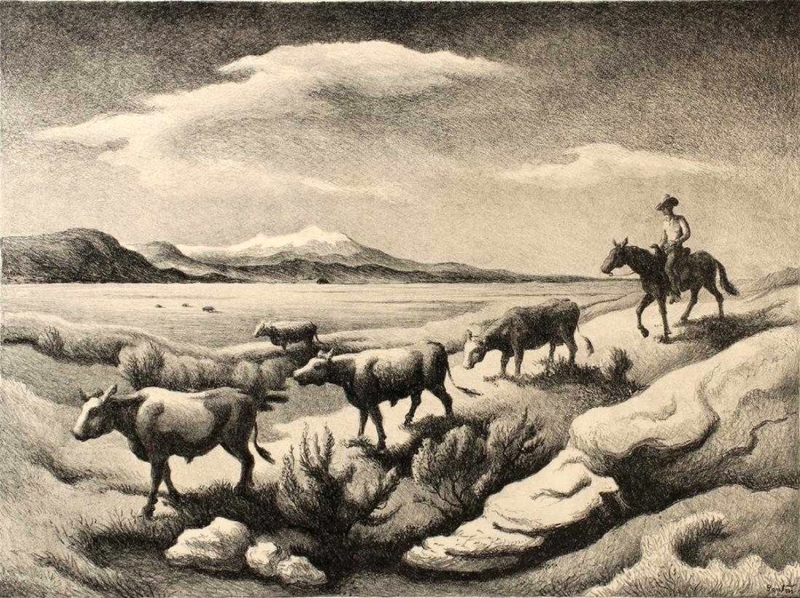 – On a chilly March 2 at Soulis Auctions, an iconic print by American artist Thomas Hart Benton (1889-1975), pencil-signed and titled “Wyoming Autumn,” sold above its high estimate at $7,670. From an edition of 250, the 23½-by-17-inch lithograph, completed just a year before Benton’s death, was the subject of many bids and was the top lot of the almost 300-lot auction. For information, 816-697-3830 or www.dirksoulisauctions.com. NEW WINDSOR, N.Y. – American Modernist artist John Marin (1870-1953) is well-known for his abstract landscapes and watercolors. 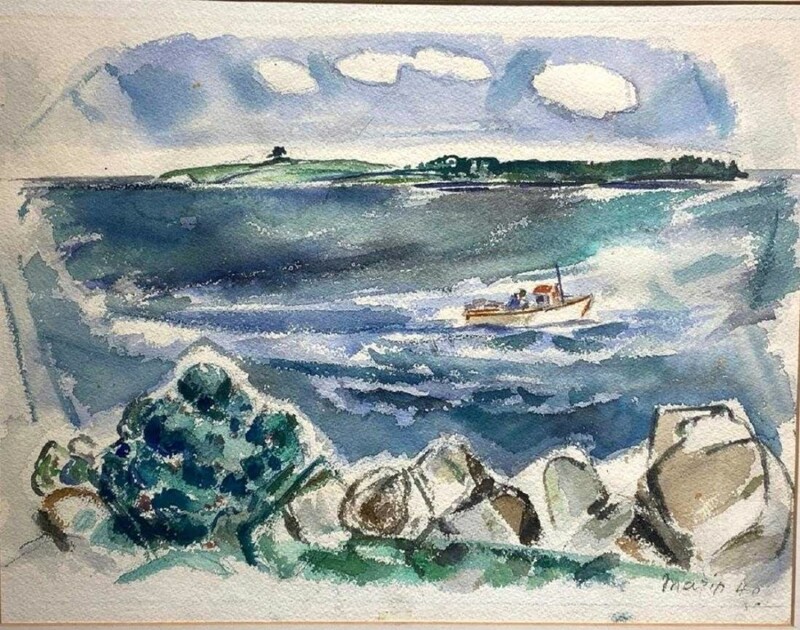 At Mid-Hudson Auction Galleries on March 2, a watercolor by Marin, signed and dated 1946, of Cape Split, Maine, sailed above its estimate to sell at $10,625. The delightful painting of a fishing boat in blue seas, just 14 by 16 inches, was offered in a simple gold frame and sold on its second bid to an internet customer. For more information, 914-882-7356 or www.midhudsongalleries.com.